mwe3: Did you set out to create a superstar session with Next? I see no less than ten different guitarists alone on here. How challenging was it to enlist all these great name artists to record with you and technically, who aided you most during the album recording sessions? Jeff Oster: Ive never started a record by making a list of musicians and then going out to get them to play on the sessions. Its a much more organic process, and is influenced quite a bit the musicians I may be playing with at the time the project begins, players I have worked with in the past that I feel might add something now, as well as players that my producers may feel would add something special -in the case of Next -thats my co-producers Will Ackerman and Tom Eaton. My records almost always begin with just me, alone in my home studio. After I had begun to do the demos, and a sense of direction began to emerge, I began to reach out to start to find players that might add to what I was creating. Tom also engineered and mixed all of Next  brilliantly  in addition to adding many key instrumental performances of his own. In this case, I started with Bernard Purdie on drums. One day I just happened to be watching a Steely Dan video on YouTube, as well as several of Bernards live performance videos. The inspiration came to see if he might want to play on my record. So, I emailed him, and asked. Shortly thereafter, my phone rang and it was Bernard. We chatted a bit about the project, and he agreed to do it. And so it began. Once Bernard agreed to play, why not ask Chuck Rainey? The two of them, together, have been the heartbeat of some of the greatest hits, ever! Chuck said yes. 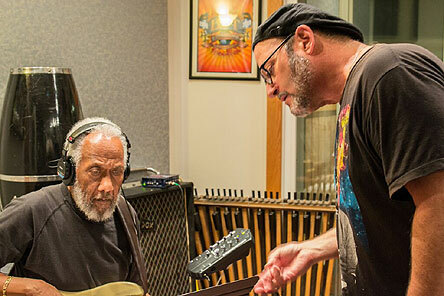 Then as I found a studio to record Chuck and Bernard - Jankland Recording in New Jersey, owned and run by Steve Jankowski - it turned out that Steve has worked as Nile Rodgers music director, and he made that connection. And, these are just a few of the players on Next. Will and Tom and I had done all of the horn tracking at Wills Imaginary Road Studios over a six day period in late October 2014. Will and Tom record some of the best artists on the planet up there in Vermont, and they bring into that studio some of the greatest musicians to add their colors to that records Will and Tom produce. A few of them have been on some of my previous albums  Michael Manring, Taylor Barefoot, Noah Wilding, Philip Aaberg have all been on my previous albums. Will and Tom have been working quite a bit with bassist Tony Levin, and as the songs progressed, I knew I really wanted him to add his signature style to them. Ive come to know pianist Catherine Marie Charlton over the past few years, and we worked for months on a few of the songs on Next. I know a young artist named Britt Brady, who lives in Eugene Oregon. Britt is a master at loops and beats, and he contributed the bed tracks to two of the songs, and adds that young sensibility to those. 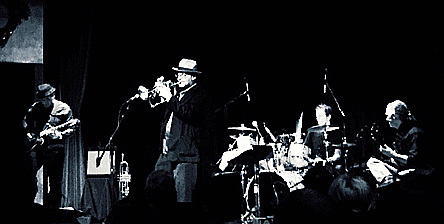 Ive also played quite a bit, both live and on record, with guitarists Shambhu Vineberg, Carl Weingarten and Todd Boston. I am grateful that they too joined me on this. When I wanted some vocals on this record, I knew that Melissa R. Kaplan, who sang on my album True, would be perfect. And she is. I play with a wonderful young sax player out here in San Francisco. Jeff Taboloff is destined for greatness, and I wanted to be one of the first to grab that spark, and have him add it to one of the tracks. And, last but certainly not least, last years New Age Grammy winner Ricky Kej and his partner in recording and performing, Vanil Viegas, added their signature sound to the track Gardens Of Varanasi. Technically, and soulfully, Will Ackerman and Tom Eaton made this record what it is. 100 hours of mixing with Tom, Wills heartfelt sense of expression producing my horn performances, and their guidance as all of these different performances came together as one record, none of what you hear could have happened without them. They are masters of their craft, and along with Bob Ludwigs incomparable mastering of all of this, I am blessed with a record that I will be proud of for the rest of my life. mwe3: What did Nile Rogers bring to the title track? How did the Next theme come together? How did Nile influence your music and what Nile albums or productions are among your favorites? Jeff Oster: Nile adds, well, Nile... You know his sound from so many hit records  Chics Freak Out, We Are Family - yes, he wrote it with Bernard Edwards!, Bowies Lets Dance, and Daft Punks Get Lucky and Lose Yourself To Dance, to name a few. Having him as a part of this record, is sort of like the cherry on top of the sundae. As the record progressed, Tom Eaton suggested that we add guitar to the title track. Hes worked with a wonderful guitarist named Scott Tarulli, and Tom wanted him to play on that track. 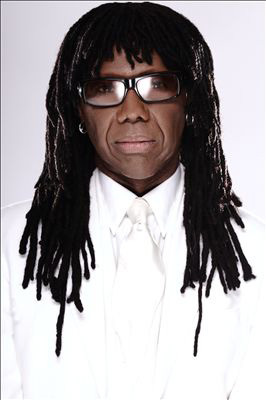 Once that track was done, wonderfully I might add, I figured, well, why not ask Nile Rodgers to see if he might add his flavor as well. I asked, and he said yes. Tom really is the one responsible for the blend of the two of them on that track, as well as the co-arranger of it. His ears and sensibilities are all over this track, and the rest of the record, along with Will Ackermans Together, I think weve created a new genre  New Age Ambient Funk. Next is about rebirth and change for me, both as a musician and in my life. Before we ever recorded one note, Will, Tom and I made a decision to make sure that my horn would be front and center. To be the lead voice, fully heard throughout the record. This too, is the next step in my journey as a performer, to be heard. Indeed, I have much more to say. Stay tuned! mwe3: What is it like recording at the world famous Imaginary Road studios? How did working with Tom Eaton help shape Next and who was involved in the engineering and mastering of the album? 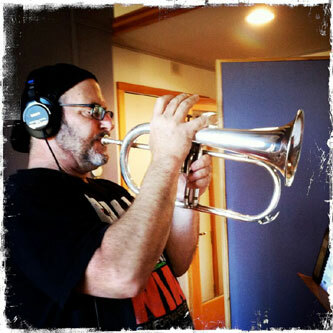 Jeff Oster: I can't imagine recording my horns anywhere else, pun intended! Because Will plays such quiet guitar, his microphones are second to none for recording instrumental music. And, on top of that, when you add Will's production experience, his ears for melody, and the engineering expertise of Tom Eaton, that studio creates the best horn sound on record of any studio I've recorded in. In terms of working with Tom Eaton, I think it's safe to say that this record would not have been possible without him. In addition to engineering, some arranging and co-producing my horn performances, he mixed the entire album. There was much that occurred during those mixing sessions that made this record all of what it is. Not only is Tom a wonderful engineer, he is an incredibly accomplished musician. There was much music performed and recorded during those mixing sessions, by Tom, that added to and completed many of the songs on Next. 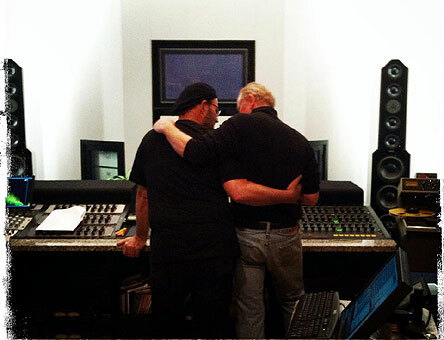 Bob Ludwig at Gateway Mastering was the mastering engineer on " Next and that was sort of the icing on the cake. 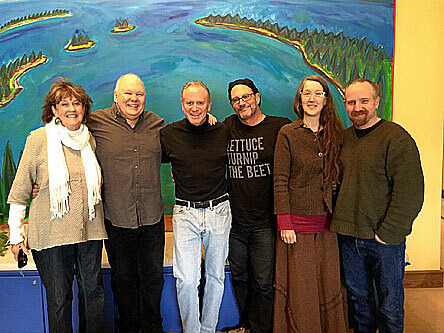 There is a secret sauce to mastering, and Bob Ludwig certainly has that recipe! mwe3: Did you set out with a specific vision of what you wanted Next to sound like and how would you compare Next with your 2011 album Surrender? Youve still got that Soho after midnight thing going on again with Next. Is Next less live and more composed compared to Surrender? How do you strike that balance between a studio and live sound? Jeff Oster: I can't say that I start out on a project with a particular end result in mind. It sort of emerges as the songs get written and performances happen. I do know that Will, Tom and I wanted to have my horn be heard on top of the mixes, and indeed we succeeded. Compared to Surrender, there is much more composed performance on this album. I started overdubs with Bernard Purdie and Chuck Rainey on drums and bass, in addition to my horn playing obviously, and we added musicians from there. That being said, every song except one on Next was written and arranged before I went into the studio, at least in terms of the horn arrangements. This was the opposite of the way Surrender was recorded, where Bryan Carrigan and I would start the day with an idea, and build a song from there. Much more "live" in that respect. And as far as that Soho vibe is concerned, it must be in my blood. I feel a deep connection to that part of New York City, and somehow I think it shows. mwe3: Whats new in the trumpet world? Why dont you think trumpet players today get the same respect as giants like Herb Albert and Al Hirt, to name a couple, did way back in the 1960s? How about in classical music? Dont you find the trumpet to be overlooked in orchestral music? (aside from Revile and Taps) Who were the greats classical trumpet players? Its also big in Mariachi music and its also coming back in surf music! Jeff Oster: I think that popular music in general has changed quite a bit since the 1960s and 70s. Herb Albert, Al Hirt, Blood Sweat and Tears, Chicago, all of those acts either featured horn or had lots of horns in them, and they were releasing hits! 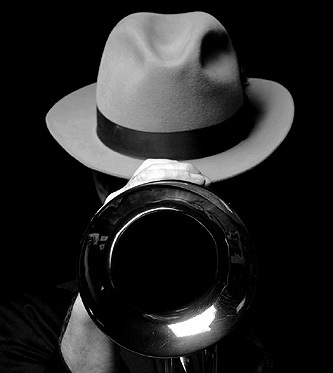 Today's mainstream music, unless it features sampled horns, doesn't use trumpet as the lead instrumental voice, except for maybe Chris Botti in the popular music world. There are, in fact, some pretty great trumpet players working today, Terence Blanchard and Wynton Marsalis obviously come to mind. Wynton especially, crosses over to classical as well. In most cases, however, straight ahead jazz is not going to be as popular as Taylor Swift. So, it's unlikely for us to hear on a widespread popular basis of lots of trumpet players like there used to be back in the day. I, of course, I am doing everything I can to change that! mwe3: I am amazed at the vast output of guitar players you have featured as guest soloists on Next. Do these guys live in the same area as you? I know Carl Weingarten is another Boy Area guitar hero. Hows Carl doing these days? Jeff Oster: There are quite a few wonderful guitarists on Next from all over the world! Im truly grateful to have them join me. There were a couple of songs that specifically were written with guitar and flugelhorn in mind  On Mothers Day and And We Dance, written with Shambhu Vineberg and Will Ackerman respectively. Other than that, as each song progressed, we decided that guitar was needed on a few of them. In the case of Next, the title track, Tom Eaton was hearing a guitar part, and asked Scott Tarulli to play. After we had recorded Scott, I had been thinking of Nile Rodgers for a long time, wanting him to be a part of this project. It turned out, that he was willing to play on the song as well, so there you have it! Tom did a great job of mixing those performances, getting the best out of both! Carl Weingarten is the best! I'm really glad he is on this album. Since Carl and I live in the same city, I do see him much more often than everyone else, and yes, he's doing great! He's always working on new music, so expect a new Carl Weingarten album anytime now! mwe3: One of the Next highlights is your tribute to your mother Phyllis, called On Mothers Day. Music is usually the thing we remember most about our mothers. What was it like to work with guitarist Shambhu? Jeff Oster: On Mother's Day was written not so coincidentally last year, actually on Mother's Day. Shambhu and I wrote that song during that evening, with Shambhu recording at his home studio in San Diego, and me in Alameda. As it turned out, a few months later my mother passed away. So, that song most certainly has special meaning, and deep emotion as you might imagine. Shambhu would be the perfect accompanist for a song like that, we co-wrote it together and working with Shambhu is always full of deep feeling. We recorded Shambhu's finished guitar part at Todd Boston's studio in Northern California. The session had been scheduled in advance, for what turned out to be the day after my mother's funeral. So, I got off plane, went to the studio, and Todd recorded Shambhu's guitar part on that song. I can't think of a better way to celebrate my mother's life, and her support for my music. mwe3: Avenue D is a great Next track with Todd Boston on guitar. Todd also did some engineering on that track. Whats it like working with Todd? Are you guys planning any other recordings? 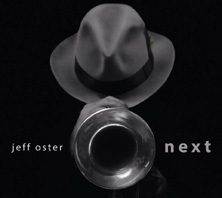 Jeff Oster: Working with Todd Boston is one of the great joys of my life. In addition to being a wonderful human being, he is an amazing guitar player. On top of that, he is an excellent engineer with a very sweet studio called The Magic Cottage that he and his incredible wife Andrea run in Northern California. I have always wanted him to be on one of my albums, and when Avenue D appeared, there was a guitar solo section that I thought Todd would be perfect for. And, as you can tell by listening, he was! Todd and I are working on some live performances in the near future, as well as the possibility of me playing on a project that Todd is currently producing. I very much look forward to our next music making moments together. mwe3: Did you record together at the same time with the other musicians or were there long distance internet files used? Do you like to record live or do you enjoy overdubbing lots of sounds in the studio? Seems unworldly get a sound file from India and put it on your album! Whats that like? Jeff Oster: The World Wide Web makes so many things possible. 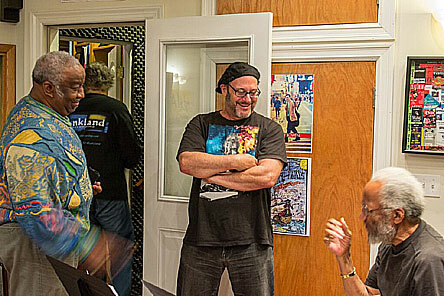 I very much like recording with the players in the room, like we did with Bernard Purdie and Chuck Rainey. It was like music fantasy camp, and I wouldn't trade that experience for anything else in the world. And, to have artists like Ricky Kej and Vanil Veigas add their music from India, or Melissa Kaplan add her vocals from her studio in Rhode Island, those are an amazing addition to the album, ones that would not be possible without the ability to trade files halfway across the world, or across the country. There are many of those on Next... Let's just say that Dropbox made that much easier! mwe3: Track ten on Next, The Mystery Of B has two bass players, Michael Manring and Tony Levin and three different keyboard players. Youve worked with Tony Levin before right? What is Tony like to work with in the studio? Can you compare the two bass players, sound wise? Jeff Oster: This was the first time I've had Tony Levin on my albums, and I have worked with Michael Manring before on my previous album True. Tony was another musician that I never got to meet, and Will Ackerman has been recording Tony quite a bit on several projects, in addition to Tony's amazing work with King Crimson and Peter Gabriel. I knew that there were a few songs that I wanted Tony to play on, and as it turns out, Michael Manring fit on The Mystery Of B as well as Ibiza Sunrise. As you can hear, Tony Levin's bass sound is quite different then Michael Manring's style of playing, and they both fit together beautifully. Each unique, yet perfect together! Jeff Oster: Looping is basically the recording of sound on sound most often on a live performance basis. It allows a musician to build harmonies and tracks to play along with, without having multiple musicians needed on stage to do so. Carl Weingarten is a master of this, and as the years have gone by, technology has advanced to make this a very powerful live performance medium. On Next I created the demos of every song on Apple's Garageband software, along with some additional loops I had created for the project. Once the demos were completed I then decided, along with my co-producers Will Ackerman and Tom Eaton, which loops would be replaced by live performances in the studio. Once those performances begin to happen, we then shape the songs into what you eventually hear on the record. mwe3: What made you choose to cover I Cant Make You Love Me? Its such a classic. No guitars but some great keyboard work from Tom Eaton and Philip Aaberg, who was one of the original Windham Hill artists. Jeff Oster: It is a classic song indeed, and one that has spoken to me, and obviously many others, at a deep level for a very long time. I knew I wanted to do a cover song, it just seemed like it was time to do that, and this one was the one that I chose for my first ever cover to be released on one of my albums. Feeling the song as deeply as I do, it really helped the horn performance for me. I actually recorded my horn part using a karaoke demo I found on YouTube as a guide! Having worked with Phil Aaberg in the past, I wanted to hear his performance on this piece, and it worked out beautifully. Tom Eaton as well is a fine Fender Rhodes and Hammond B-3 player, and you can certainly hear his excellence as well! mwe3: Have you had the chance to bring your music to England and other countries? Do you have plans to tour in the US or elsewhere? I know you lived in South Florida, when was that? What do you like best about living in the Bay Area besides the weather, the musicians and the great Chinese food! 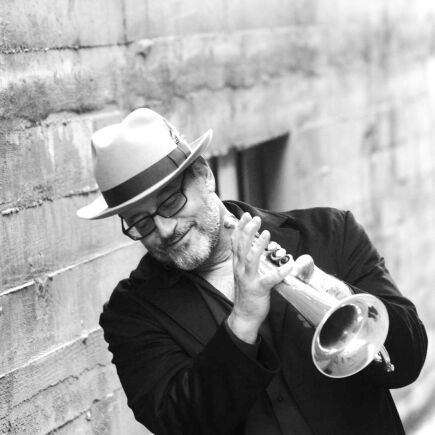 Jeff Oster: Other than a trip to England and four other European countries, playing with my high school concert band, I haven't been there to tour. Actually, I do not tour very much, just select concerts from time to time. I imagine as my kids grow older, I'll have a bit more time to do that in "retirement". I lived in Miami from 1970-76, and it was a great high school experience. Quite a unique environment, including the 99% humidity in August! Living in the Bay Area is amazing, not cheap, but it's worth it in exchange for the scenic beauty, No humidity or Mosquitos, great food and both Big Sur and the Wine Country only a few hours away. mwe3: Push comes to shove, your favorite 5 trumpet related albums of yesterday and today and why? inventive, exciting, high energy brass! Whipped Cream and other Delights -Herb Alpert - the album cover! And the songs! mwe3: Would you say youve come a long way since playing taps at a funeral for your first paid appearance? How would you say youve evolved as a musician and are there other areas of writing and recording that youre planning in the future? I was reading that Fiona Joy is planning something with you next year and she said something about Carnegie Hall! That sounds amazing. And, to bring it full circle, I just recorded on pianist Peter Jennison's incredibly moving arrangement of Taps on his new album Coming Home. Indeed, I am always looking to work with other musicians. Im playing on a very cool version of Nature Boy on Catherine Marie Charltons new album Maidens Voyage. Fiona and Lawrence Blatt and I have been talking about a super group of sorts, in our genre, and one of the ideas is a performance at Carnegie Hall. How cool would that be! Pic 7 - Photo by Craig Merrill - Oakland CA.